Please study the three characters in the attached Liberal Democrat County Council election flyer opposite. Two of these at least you may recognise as local bloggers with delusions of grandeur. One, 'Lord Matt' Thanet's self-styled "leading independent journalist," has a particular talent for English prose and is the proud author of "My Big Fat Arse.com" ...Enjoy...! "Keys, Lunatic, Asylum, Hand, Liberal Democrat, Thanet." Quite how Liberal Democrat policy on surrendering control of our Parliament to Brussels, immigration and indeed, anything else of public interest, could be reconciled by any one of them, I really don't know, as one character leans to the far left of Nick Clegg and another to the far right. However, democracy is a strange and wonderful thing, as last night in Council demonstrated. 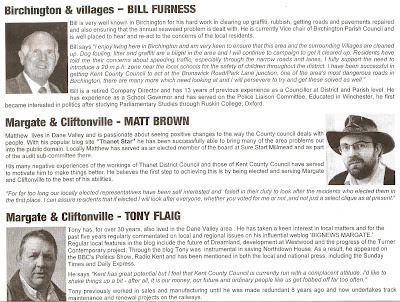 Here in Thanet, history shows we are frequently deceived by those who believe they have those unique personal qualities required for a prominent role in local politics. Back in Westgate, the BBC Radio Kent programme this morning, gave a detailed report on the town's victory over Tesco this week, with comment from the public, Tesco and the volunteers who played a vital part in drawing up the successful strategy which prevailed over the supermarket giant. Tesco have not yet indicated they will appeal and the programme can be heard again here at 24 minutes and 50 seconds after the start of 'breakfast with John Warnett and Clare McDonnell. Pictured left and below, are Martin Powell and Jonathan Simmons who played such a vital part, with Dr Dawn Crouch, in assembling the material we needed to challenge Tesco's planning application. We are now in the process of starting a local group to devise a 'Neighbourhood Plan" building on the work done with the Tesco objection and which will, under the introduction of the new localism policy by Government, offer the residents of Westgate, far greater control of what is built in our town and where. Well, I hope the 'Neighbourhood Plan' involves some sort of solution to the monopoly that the Co-op has here in Westgate. The Tesco store was our last opportunity to make the Co-Op store do something about their outrageous prices. Well done all the objectors, now stop moaning about how much you are charged for stuff that Edwards don't stock and you can only buy at inflated prices at the Co-op. It's even worse in Birchington where BOTH supermarkets are Co-Ops, just a few doors away from each other! Not even Tesco have gone that far, yet they're the ones who people complain about! The beauty of two Co-ops in Birchington is that if one shop hasn't got what you want the other one hasn't either. As a recent 'in-comer' I can say that where I was living a pub was converted into a Tesco about 150 yards from an existing co-op. The competition did not false the co-op to rethink their pricing policy, and the difference in prices between the two stores was minimal.The small Tesco was certainly not as cheap as the large Tesco about three miles away.